Helmets are a type of armour used to protect the head from injury. 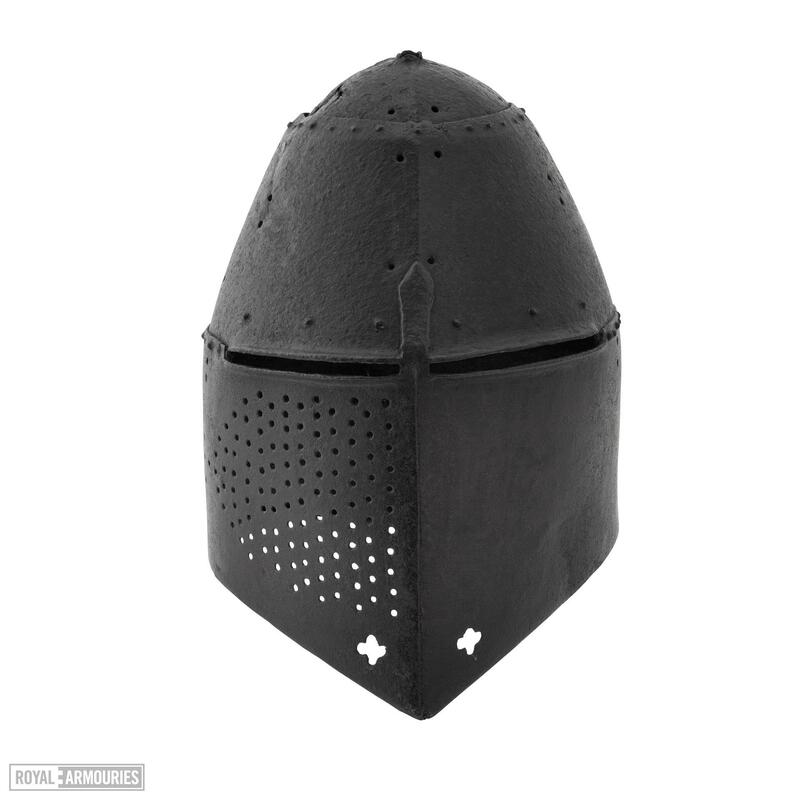 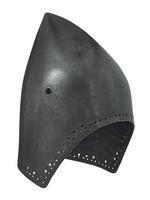 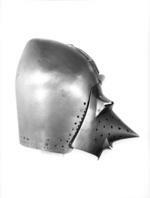 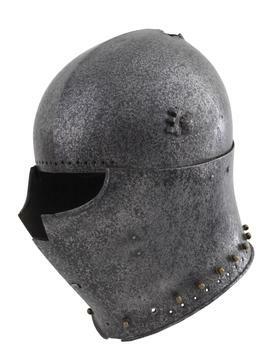 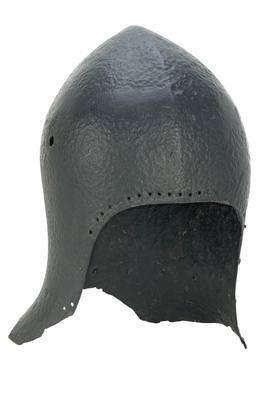 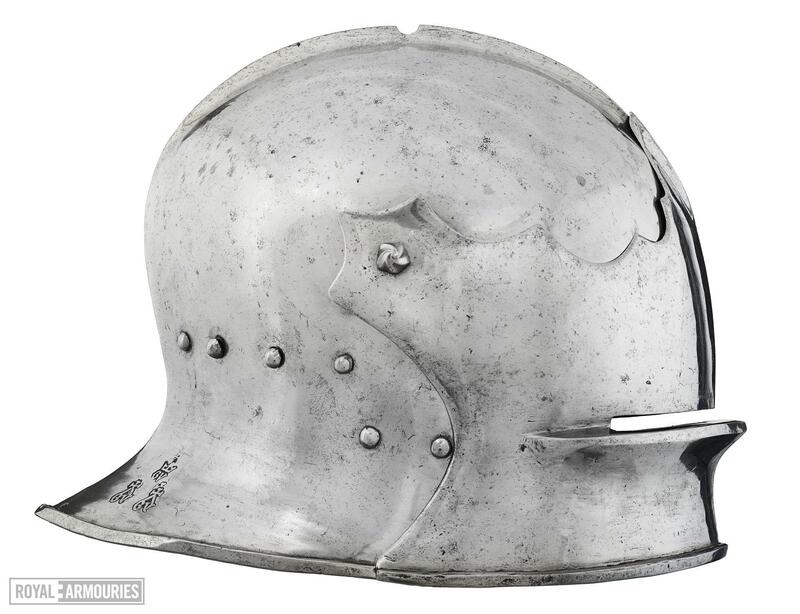 During the Hundred Years' War, many different types of helmet were in use. 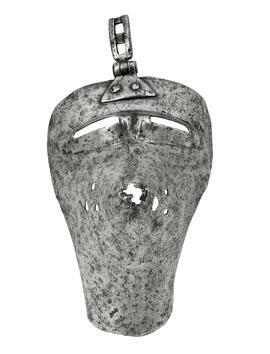 Each offered varied levels of protection, and the type worn would have depended upon your status and role on the battlefield. Great helms were common among cavalry at the beginning of the Hundred Years' War. 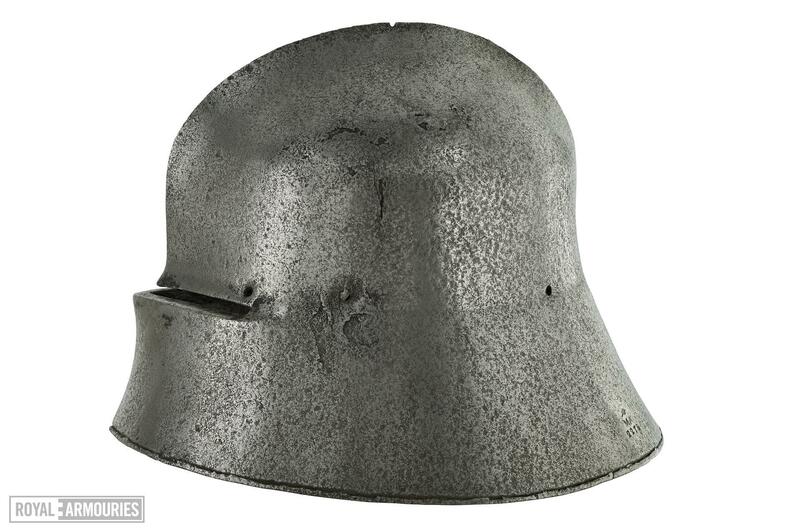 They were cylindrical flat-topped steel helmets that covered the entire head and neck, with small gaps pierced for sight and breathing. 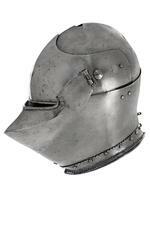 Gradually, the bacinet came to be preferred in combat, and the great helm was gradually relegated to tournament use. The bacinet usually had a removable visor that could be closed to protect the face, and a short curtain of mail (known as an aventail) that would have hung from the helmet to protect the throat, neck and shoulders. 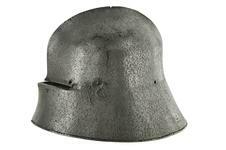 Another common helmet of the time was the sallet. 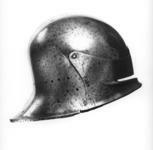 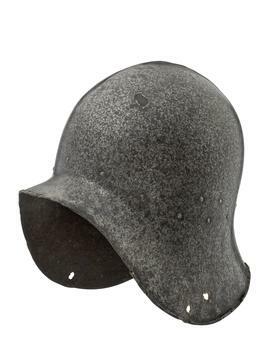 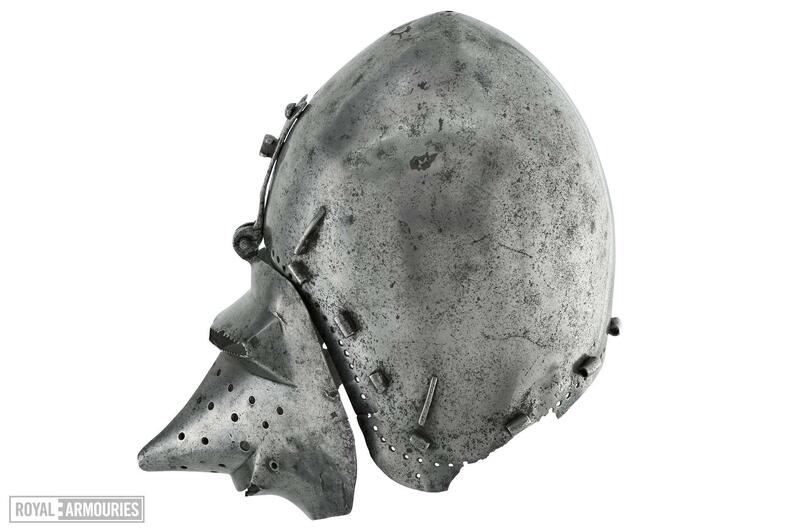 This helmet could be made from one piece of metal with either a slight cut in to the front face or with a broad open face, over which a visor could be fixed. 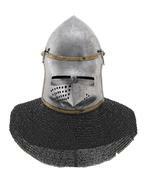 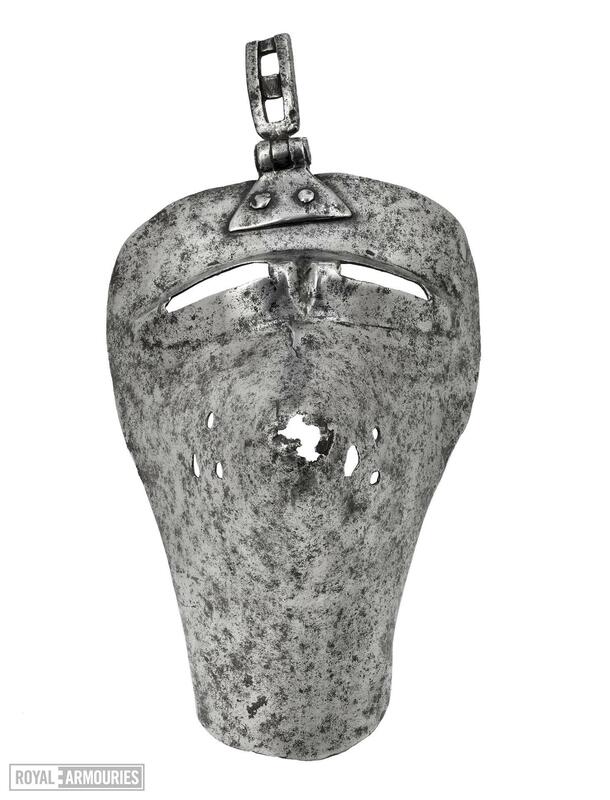 By the mid-15th century, an extended tail gave increased protection to the nape of the neck. 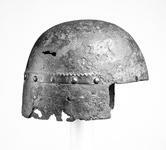 An armet, which completely encased the head, also proved popular. 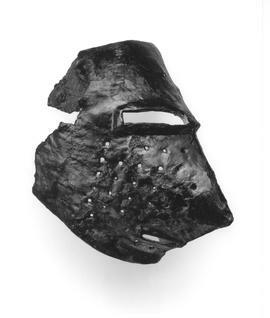 Hinged cheek pieces, attached to either side of the skull, were raised to allow the wearer to put it on and lowered to lock the helmet into place over the chin. 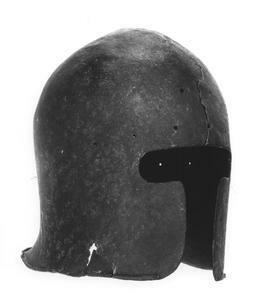 Different helmets offered different levels of protection. Although great helms offered good protection, they had several problems. 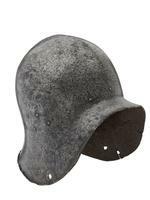 They offered limited vision, could become stuffy during use, and were comparatively heavy. 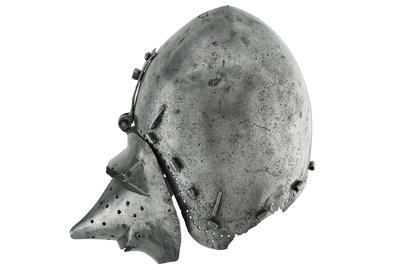 The bacinet, despite being lighter than the great helm, would also have been quite heavy to wear (as a result of the combined weight of the metal helmet and mail aventail). Armets and sallets allowed for better vision and, with movable visors, allowed better ventilation whilst still protecting the face. During the Hundred Years' War, many helmets would have also included a pointed movable visor which would have protected soldiers' faces. 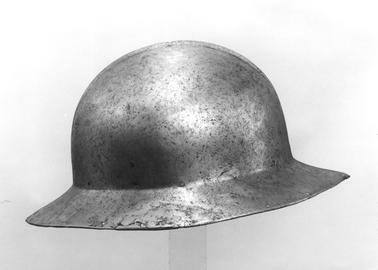 The acute points of these visors increased their effectiveness in warding off and deflecting sword and missile strikes. These brims or visors were not worn by archers, as they needed unrestricted vision and the ability to draw the bowstring to their face. 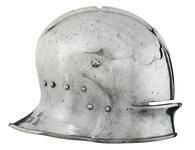 Helmets could also be lavishly decorated to demonstrate wealth and power. In some cases, gemstones were inlaid in to the helmet, or gold circlets were worn on them. Richly embroidered textile coverings might also have covered the aventail.